The Russians were aware that the Mongols existed but knew nothing about them until 1224. It was this year that the “unknown [Mongol] tribes came, whom no one exactly knows, who the are, nor whence they came out, nor what their language is, nor of what race they are, nor what their faith is, but they call them Tartars.”(53) The Russians faced nothing but questions of who the Mongols were. The Russians would become aware of the answers to these questions and the violent attitude of the Mongol Khanates. The Russians understood and declared that only God knew who they are and where they originated. In addition, they might know much about the Mongols but they understood that scholars had written information for the sake of the Russian princess memory. Through this, the Russians had an understanding of the Mongol conquests. This made the Russians aware of the Mongol conquests, but they were not aware of their intoleration of religious beliefs in this stage of the Mongol empire. This resulted in the Mongols reverting back to plundering. The Russians understood and declared that only God knew who they are and where they originated. In addition, they might know much about the Mongols but they understood that scholars had written information for the sake of the Russian princess memory. Through this, the Russians had an understanding of the Mongol conquests. This made the Russians aware of the Mongol conquests, but they were not aware of their intoleration of religious beliefs in this stage of the Mongol empire. This resulted in the Mongols reverting back to plundering. The Mongols systematically destroyed and plundered the towns of Russia with no regard to their religious beliefs or practices. It was common for the Mongols to begin military actions of days or weeks that held religious significance. The city of Torzhok experienced this tactic when the Mongols began their conquest on the first Sunday in Lent. The Mongols used their regular tactic of isolating the town by fencing it off from the world. Once the town was isolated, they would wait – while fighting for two weeks – until the Russians were too exhausted and weak to defend themselves any longer – with no help coming for them. 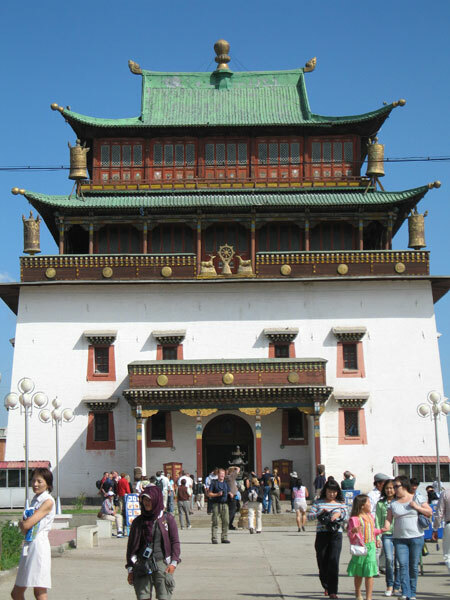 In time, the Mongols took the town to kill all of its inhabitants including the religious figures. (54) The Mongols ceased to tolerate and incorporate the state religion because the Mongols interests reverted to the short-term benefits. The Mongols were no longer interested in the long-term economic interests of their conquests. Consequently, the Mongols did not care about building the cultural exchanges as in the past. As a result, they no longer had a need for religion – its use as a tool was not an interest of the Mongol ruling elite. The Mongols plundered a region until they saw no more wealth. However, it was possible to set the Mongols to stop if the regions elites could convince them that they gave up everything the Mongols desired. In some instances, religious leaders were able to convince the Mongols to end an attack and leave but this did not guarantee that they would not return. In this case, it was not long until the Mongols returned. The same winter, the Mongols returned to do much “evil” in the territories to receive the people’s contributions. The Mongols began to fear for their lives because of the unrest in the region. Therefore, the Mongols requested that Prince Alexander provide them with protection. The Prince honored their request by sending the Boyars sons to protect them. The Mongols believed that the protection of the Russian guards would entice the people to give their tribute. However, numerous people remained steadfast and refused to give their numbers for tribute because they preferred to die honorably for St. Sophia. The Russian people were divided into the people who were steadfast to their religion and those who immediately went to be counted for tribute. The dividing factor is that the Mongols were sent to punish them for their sins. (55) The Mongols change in religious policy shifted their long-term plausibility as an intact empire. Religion continued to play a role between different cultures, but the Mongols divergence of using it as a linchpin for political, cultural, and economic expansion shifted the long-term plausibility as an intact empire. The neglect of long-term interests became the downfall of the Mongol empire. The Mongols under Chinggis khan and his immediate successors had built a stable empire that involved numerous policies in a syncretic fashion. The breakup into the Mongol Khanates led to religion no longer being used in a syncretic fashion for the long-term obtainment of economic wealth. 53 Mitchell and Forbes, eds., The Chronicle of Novgorod, 64. 55 Ibid., 83, 96, 97.